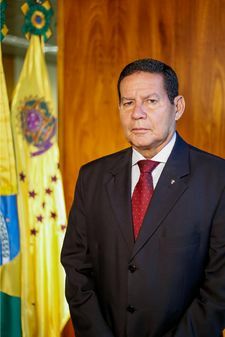 Hamilton Mourão is the vice-president of Brazil, serving since January 1, 2019. Elected on the same ticket as conservative Jair Bolsonaro, Mourão is more liberal than Bolsonaro despite appearing to be the more conservative of the two candidates before the election. ↑ Bresciani, Eduardo; Soares, Jussara; Gamba, Karla; Pereira, Paulo Celso (February 1, 2019). Mourão defende que aborto seja uma opção da mulher. O Globo. Retrieved March 23, 2019. ↑ Biller, David (September 19, 2018). Bolsonaro’s Running Mate Threatens to Derail His Moderation Strategy. Bloomberg. Retrieved April 16, 2019.